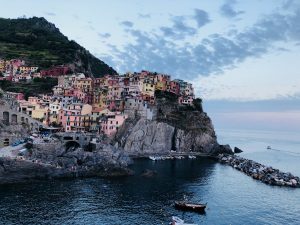 When I first walked into the city of Manarola, the second of the five seaside cities on the Eastern Riverian coast of Italy, a part of what is known as the Cinque Terre, all I could do was stop and stare. Yes, there were tourists also marveling at the bright and colorful cliffside buildings and turquoise blue water brushing against the rocky shore, but what initially caught my attention were those people who were not star-struck and amazed by what I believe is one of the most beautiful places on Earth. Colorful buildings of this beautiful seaside town. These people were most definitely the locals, immune to their insanely beautiful touristy town, instead, going about their business, gathering herbs and fruits from their terrace gardens hidden away from common view. They wove baskets and sculpted beautiful pieces of artwork on the street sides, completely unfazed by the beauty around them, instead choosing to laugh with one another and talk about their days. It made me ponder how long they had lived there; was it a short stay, a few years, or their whole lives? When I arrived at my hotel, a bright orange building with a rusty red roof, I asked the owner, who, might I add, ran, cleaned, and took care of his whole business by himself, what it was like to live in such a wonderous place and how long he had lived there. 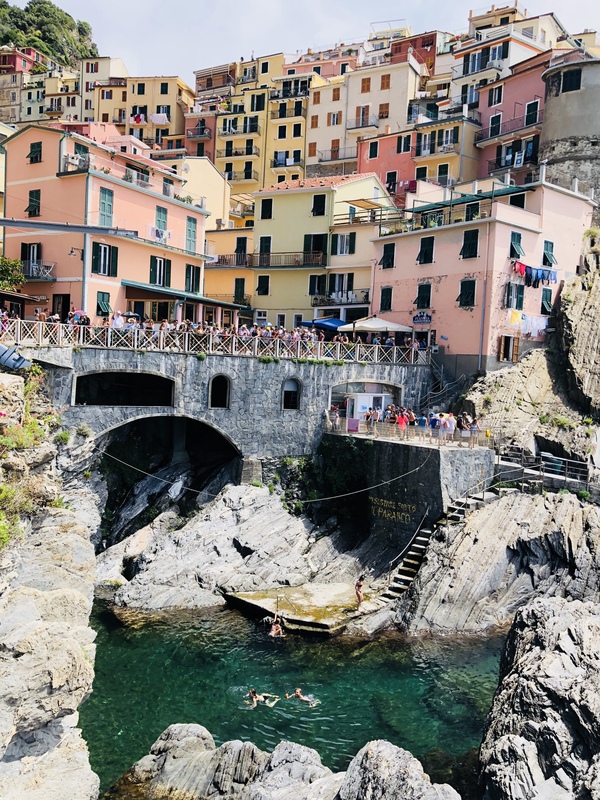 He told me he had lived in Manarola his whole life, and that living in such a beautiful place has always just been home. He relayed how most of the locals had all grown up alongside each other, bonded together through the fact that they all lived in this secluded paradise. He mentioned how he had inherited this building from his Great Grandfather who had once used it as a winery, and how it has been in his family for generations and generations. He told me he had never dreamed of leaving his beloved seaside town, for when a place has such an influence on your upbringing and is woven within your ancestors, it becomes not only a place to live, but a home. His words really resonated with me; I feel that in the United States, it is customary to move around your whole life, away from home to attend school, or to follow your career path to the distances it takes you. The ideals he mentioned opened my eyes to not only the differences in the United States and Italy, but to the differences in two cultures, neither better, just different. Manarola will forever be placed in my heart as foremost, one of the most beautiful places on this Earth, but its residents will also be a constant reminder to live simply and enjoy the beautiful life you lead. 1 Comment to "A Seaside Village of People as Colorful as their Beautiful City"
What an experience! Glad you were able to experience the beauty of the soul of the people as well as the beauty of the region!